COLLEGE STATION, Texas — Edward Cheserek entered this meet as an NCAA legend; Colorado sophomore Dani Jones took the first steps toward becoming one this weekend by kicking her way to two national titles, anchoring the Buffaloes’ distance medley relay to victory on Friday night and following it up with another last-gasp victory, running down 5,000 champ Karissa Schweizer of Missouri to win today’s 3,000 final in 9:09.20. Cheserek, meanwhile, completed the 5,000-3,000 double for the third time in four years, holding off Syracuse’s Justyn Knight to win in 7:55.91. That brings Cheserek’s haul to 15 individual NCAA titles (3 XC, 7 indoor, 5 outdoor), tied with UTEP’s Suleiman Nyambui for the most in history (Cheserek, unlike Nyambui, also has two DMR victories on his resume). We recap both 3k’s below, followed by analysis and interviews. Just two hours after surprisingly getting soundly beaten in the mile final (LRC Upset City! New Mexico Freshman Josh Kerr Stuns Edward Cheserek & Runs Away With 2017 NCAA Mile Title), Cheserek took to the track for his second race of the day and fourth in the past 25 hours, the 3,000 final. The early pace wasn’t super slow, but at 1600 meters (4:25), the entire field minus Colorado’s Ben Saarel (doubling back from mile) was still in the race. 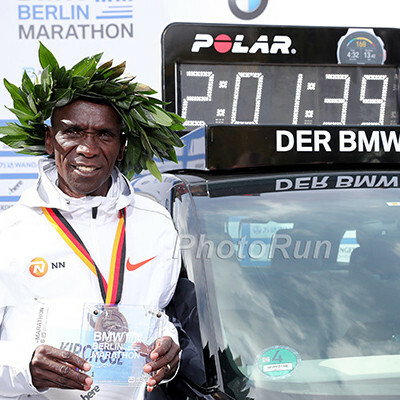 The race began to take shape when Cheserek went to the lead with six laps to go, dropping a 30.14, at that point the fastest lap of the race. Washington’s Colby Gilbert and Knight followed and the three were threatening to break away with 1k to go. 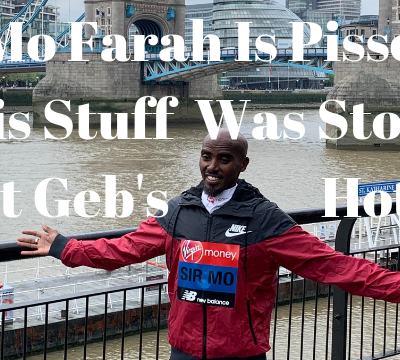 But Cheserek did not want to hit top gear with so many laps remaining, and with four to go, they had not broken away from the pack even though the race was stringing out single-file. Cheserek had covered the 800 from 1600 to 2400 in 2:01.69, and the grueling pace was beginning to take its toll. With three to go, Cheserek, Knight and Gilbert were separating. Tulsa’s Marc Scott was the only man to try to bridge the growing gap, and he caught them with 500 to go to form a four-man breakaway. Knight waited in second until the penultimate lap, at which point he made a bid for the lead on the homestretch. But Cheserek held his own, and as he hit the bell, he shifted into a sprint. Knight picked it up as well, but Cheserek managed to open a four-meter gap by the back straight. Knight hung around, searching for any last reserves of speed, but Cheserek, on his 56th and final lap of the weekend, was still going strong and held that gap all the way to the finish line, closing out his 15th NCAA title in 7:55.91 with a 26.99 final 200 and a final 1600 of 4:01.83. Knight was second in 7:56.21, matching his NCAA XC finish from November, while Tulsa’s Marc Scott (7:57.19) took third to finish out an impressive double of his own after taking second in Friday’s 5k. Cheserek came up short of his audacious goal of winning the mile, 3k and 5k, but his results — 1st in the 3k, 1st in the 5k and 2nd in the mile — were still spectacular. Time and again, Oregon has asked more of Cheserek than any distance runner in the NCAA, and time and again, he delivers. For most runners, taking first and second in two NCAA finals would be a career-defining accomplishment. For Cheserek, it was another day at the office. We spoke to Cheserek at length after his big weekend. 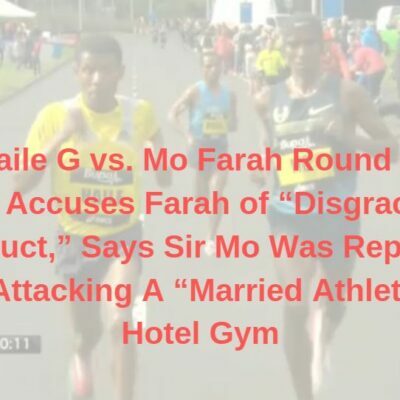 He told us that he wanted to run the DMR on Friday, but his coaches decided it was best to rest him for the grueling day of finals ahead of him. Overall, he was pleased with his results. Cheserek now has 17 NCAA champion trophies (15 individual, 2 relay) and countless other honors and says that he’s running out of room in his house to store them all. The new ones go under the bed, mostly. 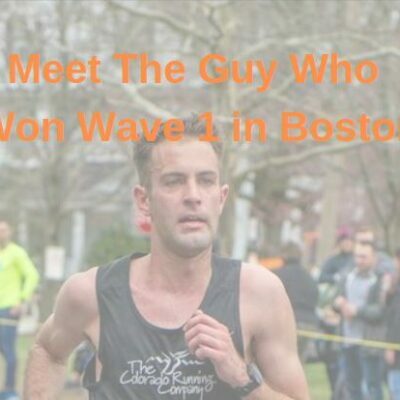 He’s won those trophies at every distance from the mile to the 10,000, but joked that he wants to expand his range even further as a pro. Cheserek was in good spirits and politely did not want to talk about the status of his quest to become a U.S. citizen and whether he’s considered trying to compete for Kenya — topics he has rarely discussed in the media. He declined to talk about the first subject and deflected the second. 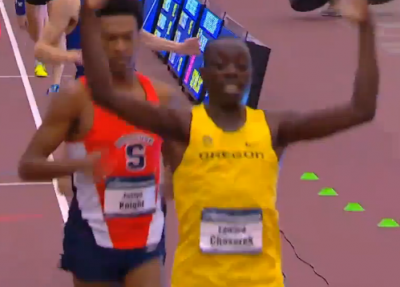 Cheserek’s win was not a surprise as we’re accustomed to his greatness. But you begin to appreciate it more when you realize that the two other guys doubling back from the mile final two hours earlier — Matthew Maton and Saarel — finished last and second to last. It is not an easy double. This was a one-spot improvement for Knight on last year, but he isn’t satisfied with finishing second as he thinks he can still improve his positioning and tactics. He wants to focus on racing to win outdoors and thinks that can put him in the World Championships representing Canada. After a 34-second first lap, the pace began to lag, and the next two laps were run in 39.20 and 41.42 seconds. By 600 meters, Karissa Schweizer found herself in the lead and was content to stay there and keep it slow and set up the deadly kick that she used to win the 5,000 on Friday night. It stayed that way until the 2k mark (6:17.64), at which point Stanford’s Vanessa Fraser had had enough and dropped a 35.74, the fastest lap of the race since the first. But 35’s and 34’s were not enough to drop most of these women, and with two laps to go, the pack was still bunched with eight women within a second of the lead. 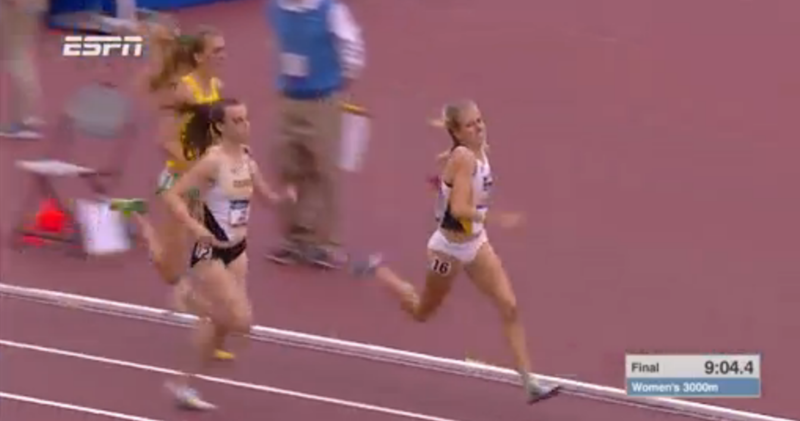 Colorado’s Dani Jones, just like last night’s DMR, was the final woman in the lead pack, in eighth place with 400 to go. The pack was so tight that as Schweizer tried to move out from third place coming out of the first turn on the penultimate lap, she ran into Oregon’s Alli Cash in front of her. The contact sent both women toward the outside of the track, but while Cash was shuffled back in the pack, Schweizer was bounced back to the inside as Oregon’s Katie Rainsberger put out her arm to steady herself. Schweizer wound up taking a step on the inside of the track, but she was able to step back on in third and was up to second behind Fraser with 300 to go after passing Rainsberger on the inside. Schweizer finally got to the lead at the bell, but seven women were still within a second of her. 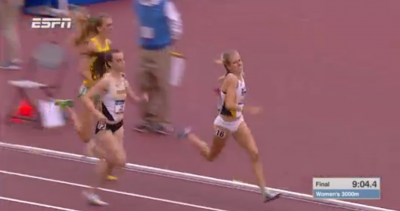 Rainsberger was right behind her and Jones had moved into third, exactly where she was at this stage of the DMR on Friday. Those three were still single-file entering the final turn, Jones about five meters back of Schweizer with Rainsberger in between them. 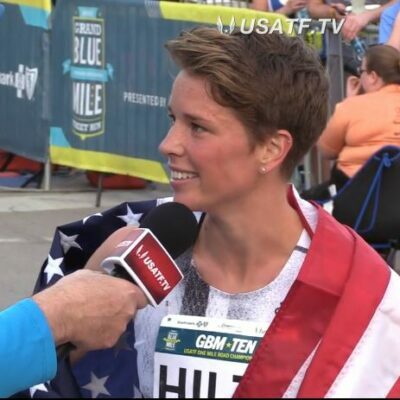 Just as she did on Friday, Jones swung wide as she exited the turn, and just as she did on Friday, she timed her kick perfectly, motoring past Schweizer less than 20 meters from the line to earn her first individual title in 9:09.20 and cap a fine weekend. 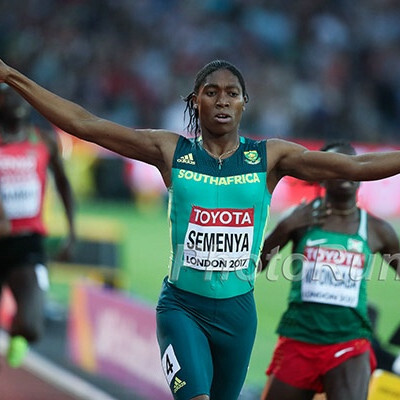 She ran her final lap in 30.81, easily tops in the field. Schweizer was second in 9:09.33 with Rainsberger just behind in 9:09.87. Jones ran 4:13 last year and was 9th in the NCAA 1500 final as a true freshman, but she’s really come into her own as a sophomore as she was 22nd at NCAA XC and now has a pair of NCAA titles on the track — one individual and one on the relay. “It’s something that I really wanted but kind of one of those things… I didn’t really think it was going to happen,” Jones said. Surprisingly, Jones said that she doesn’t usually trust her kick much as she was getting dropped late in 1500’s last spring, but she believes Mark Wetmore and Heather Burroughs’ strength-oriented system has improved it this year. Jones still has a ways to go to catch up to Colorado legends such as Jenny Simpson and Emma Coburn, but she now has something in common with both of them: an NCAA title. At only 20 years old and with a championship-caliber kick, Jones certainly has a bright future ahead of her. She says seeing Jenny and Emma at practice from time to time helps her. Schweizer came .13 from pulling off a distance sweep and despite missing out on her second NCAA title in 24 hours, she was pleased with second place. Schweizer said that she didn’t mind leading; her problem was that when she wanted to make her move with 600 to go, she couldn’t get to the front as she was boxed in a tight pack. Schweizer was able to finally free herself just before the bell, but by that point it was too late as the big kicker Jones was still in the race. Had Schweizer’s race gone to plan and she was able to move with 600 to go, we would have liked her chances. Instead, this will go down as a lesson in positioning for Schweizer, who held the lead for the majority of the race but was not where she needed to be when she wanted to make her move. Remember, when she won her past two NCAA titles, she was facing two noted non-kickers in Notre Dame’s Anna Rohrer and Michigan’s Erin Finn, and both times, she had plenty of room to move. As Schweizer continues to progress — and based on what she’s done, a time in the low 15:10s or sub-15:10 isn’t out of the question this spring — she’ll need to become more comfortable running in big groups and work on setting herself up better to kick. Schweizer was in very good spirits, however, especially considering that at this time last year, no one knew her name.